Frequently Asked Questions - BidCal, Inc.
What time does the item I am bidding on close? Where do I find my watchlist? I want to change my payment information, how do I do that? What qualifies as certified funds? If I type in 27 Freight Lane, Chico, CA into my GPS why does it comes up Transit Way? Do I have the wrong address? Where do I find a map or an address to the auction location? How do I monitor the auction as it is closing without refreshing all the time? I don’t want to have to sit and babysit my bids, what do I do? What happens if I cannot pick up on one of the scheduled pick up days? Once the auction has started you will notice a clock symbol on the right hand side of the lot description that has the number of days, hours and minutes left until that item closes. Soft close is when the lot won't close until all bidding is finished regardless of what time the item was scheduled to close. Our soft close is set for two minutes. So if anyone bids on an item in the last two minutes, bidding will be extended for another two minutes. For example. There are 45 seconds left before the item closes and I currently have the high bid. Someone then out bids me so the bidding is extended an additional 2 minutes. I now have 2 minutes and 45 seconds to decide if I want to increase my bid in order to win the item. If I bid again at 1 minute left on the item the bidding time extends to 3 minutes so my opponent can have a chance to bid again. This continues until no one makes a bid in the last 2 minutes and time runs out. 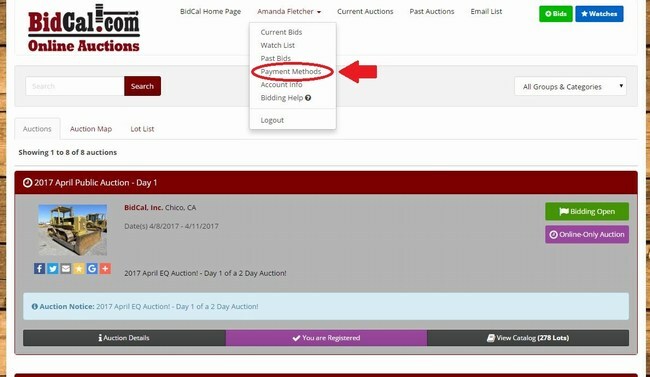 Once you are signed into an auction and create a watchlist there are two ways to find it. First, in the upper left hand corner of the page is a blue button that says watches. Click on the blue square and you will see your watchlist. The second way is when you are signed in you will see your name on the upper right hand side of the page with a drop down arrow. Hover your mouse over your name and it will come up with a menu with watchlist as one of the options available to select. When you are logged in go up to your name on the upper right hand side of the screen and go to the drop down menu. Select payment information from the drop down menu to edit your credit card on file. 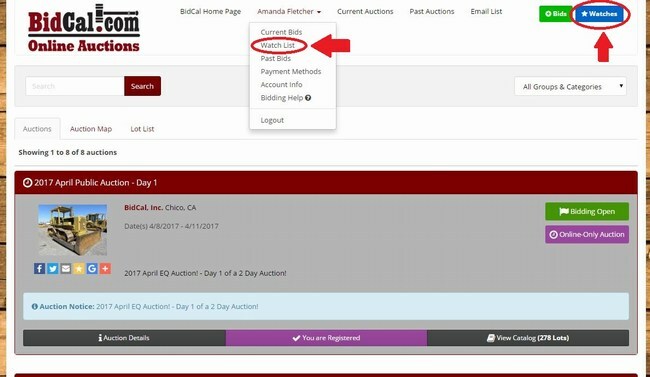 However, if you have already registered for a current auction the change won’t register in the BidCal system until you register in the next auction. So if you have any questions, please call the office at 530-345-0840 to ensure you have the right card on file. Cash, Cashier’s Check, certified bank check & wire transfer – NO PERSONAL or BUSINESS CHECKS!!! No, you don’t have the wrong address! Freight Lane is labeled as transit way on some maps. If your map shows Transit Way it will still take you to our location. General directions to BidCal: Coming from 99, take the East Ave Exit. Head West on East Ave. It dead ends into Hwy 32. Take a right onto Hwy 32. About a mile down the road Freight Lane is on the right hand side. It is the first right after Muir Ave. If you see the Mud Creek Bridge or Meridian Road you have gone too far. Typically, we wait to post the address until a day or so before the auction opens. Then, underneath the auction title on the homepage you can find the address and a "Map It" link that points to a Google Map of the auction location. The website has a handy feature called “Live Auction View”. It appears 30 minutes before the auction closes and will be a flashing button on the upper right hand side of the page. Click on “Live Auction View” and it will continuously update the bidding on the lots that are currently closing. You don’t have to refresh. You can even bid from that page which makes it more like watching a live auction! There are two ways to check what you have won. While logged in your account, click on the “current bids” tab. Next to each item you placed a bid on, there will be an icon that will tell you whether you won the lot or were outbid. You can get to this tab by clicking the arrow next to your name in the upper right hand corner of the screen. You will also receive an itemized invoice through email shortly after the close of the auction. Be sure to check your junk mail if you did not receive an itemized invoice. We have a great feature called the Max Bid Feature to help you out. To use the Max Bid Feature, enter the maximum amount that you would like to bid on an item. Then the system will automatically bid on your behalf up to the amount you entered. For example. The bid is currently at $5, you think at the most the item is worth $100. Type in $100 in the bid box and that is your max bid. You will now be winning the bid at $10 unless the other bidder has placed a max bid as well, in that case the bid would jump to the next increment above their max. Say they had a max of $50 and your max was $100. The bid would now be $55. As a small company, we are very limited on space and manpower. In order to run auctions efficiently, it is crucial that bidders pick up and pay for items before the last pick up date. We ask that you plan on picking up on one of the scheduled pick up days, or contact us prior to bidding. If something happens after you won lot(s) and cannot pick up on one of the scheduled pick up days, please contact us immediately. We are willing to work with you! However, on some auctions we don’t have any wiggle room due to seller deadlines. You will still need to register for the auction with a valid credit card. Then notify our office that you do not want us to run your credit card. Notification to the office can be made by phone, email, or in ‘Notes to the Auctioneer’ during the registrations process.